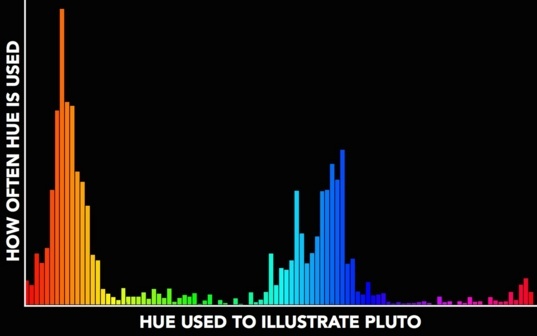 Where did the common idea that Pluto is blue emerge? Astronomers have known for a long time that Pluto’s surface is reddish. Pluto is a distant and very cold world, and thoughts of ice might lead an artist to choose cool blue hues; have illustrations favored a blue Pluto despite our knowledge of Pluto’s true reddish hue? 1) Tinted images of Ganymede are often used as stand ins for Pluto. 2) A spectacular array of imaginative colors for Pluto have been adopted in these images. Seeing all these images, I began to wonder what the typical Pluto illustration looked like. To find out, I collected 60 unique images that purported to represent Pluto from the web, then masked out the backgrounds and any overlying text as best as I could by hand. 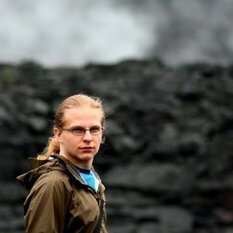 Using Python, I extracted the pixels from these images that are well illuminated. For each image I estimated a ‘typical color’ — I used a kernel density estimator to compute the modal color. This is not an average color, as in some cases the Pluto images have very distinct regions of different colors, and the average would be a muddy color somewhere in between. The modal color represents the most common pixel color in the image. 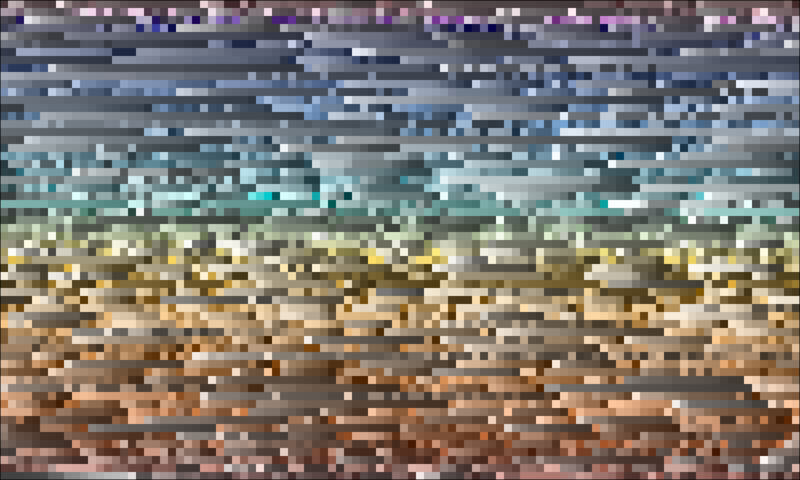 Next I pulled 100 illuminated pixels from each image, and sorted these 6000 total pixels by their hue. This captures the full range of colors used to illustrate Pluto across the internet — including any blotches or spots of different colors in any individual image. 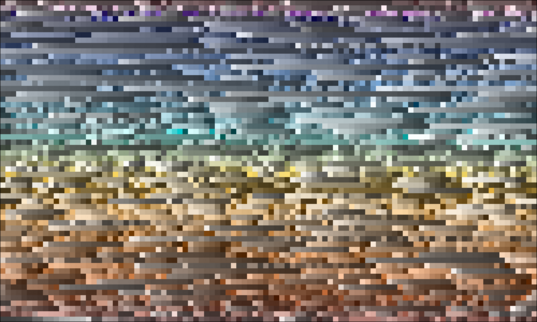 Finally, I collected all these 6000 color samples, looked at their distribution of their hues a histogram — counting up how often each particular hue was used. Since I am considering only hues here, I am illustrating them as if they are fully saturated to show where along the spectrum they fall. The two peaks show that illustrators prefer to use either red hues or blue hues. Since both peaks cover nearly the same area, blue colors are used for illustrations of Pluto nearly as often as red colors! There are two very obvious clumps; one red, and one blue! 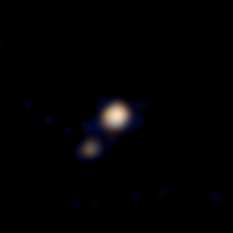 While the single most-often used hue for Pluto is in the red clump, Pluto is drawn with blue hues nearly as often as it is drawn with red hues. It is occasionally (though infrequently) drawn with greens and magentas as well! In summary, artist’s interpretations of Pluto are drawn with blue colors nearly as often as they are drawn with (more accurate) red colors. Hopefully, as New Horizons nears Pluto this summer, the spectacular new color imagery it collects will help dispel the misconception that this distant icy world is blue! Hands down, this wins today's contest for "most resourceful - and colorful - use of the Internet." Thanks for letting your curiosity carry you along, and sharing the results. not trying to be picky or anything , but on the 60 unique images of pluto , if you look at the first one upper left and count right to the 5th one then the fourth one down (blueish) is actually are own moon .